I bought a new air pump for our air mattress a few weeks ago. Our previous pump plugged into the wall - which was great when we were using it at home. But it wasn't so great when we were camping. Trust me, it's embarrassing to have to fill up your air mattress while plugged into an outlet in the bathroom. I was very happy when that pump finally quit working, and gave me a reason to go buy a new pump. The new pump has a battery that charges. As long as it's charged I can use the pump where ever and when ever I need to. I took the air mattress and pump on a recent camping trip. During the trip the box that came with the pump fell apart. 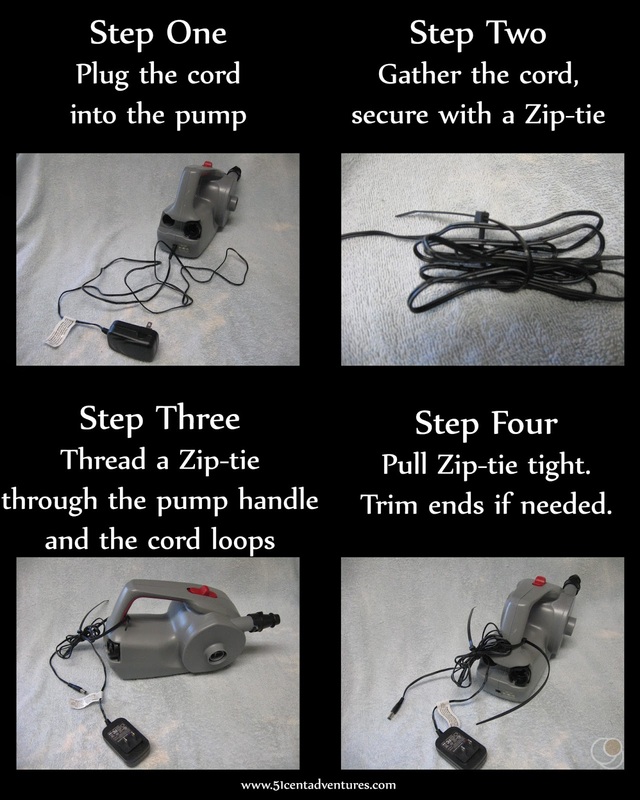 I was worried that I would loose the little electrical cord that I need to charge the pump. I decided that I'd make sure the cord and the pump couldn't be easily separated. 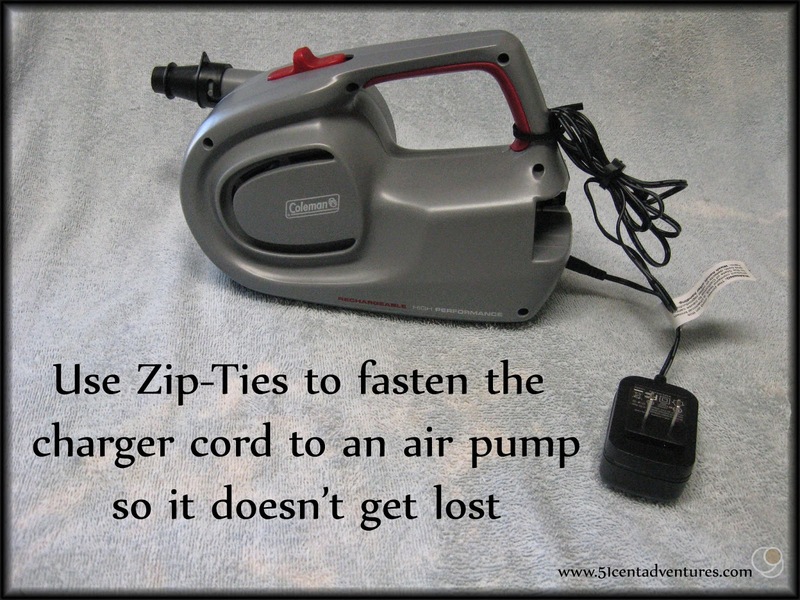 I decided to fasten the charger cord to the pump with Zip-Ties. You could also use string, yarn, twisty-ties, or similar items. The process was fairly simple. I started by plugging the cord into the pump so I wouldn't make everything too short by accident. Then I gathered the cord in my hand and secured it with a Zip-tie. After that I took a second Zip-tie and threaded it through the loops in the bunched up cord. I also threaded it through the handle of the pump. Then I pulled everything tight. I figured that 9 times out of 10 the pump wont need to be very far away from the electrical outlet while it is charging. So it's okay to fold up the length of the cord. On the off chance that I do need the whole cord I can always cut the Zip-Ties and replace them with new ones later. After I secured the cord to the pump I decided it would be a good idea to store the pump and the air mattress together. I did this several years ago with a different pump and air mattress, but for some reason I stopped doing that and used the bag for something else. I needed a bag so I found an old pillowcase in the bottom of the draw where I store linens. It's was an ugly pillowcase, but I'm okay with that because I plan on taking it camping where it will probably get dirty anyway. I loosened some stitches in the casing around the end of the pillowcase, and used a safety pin to slip in a ribbon to act as a drawstring. I like the peace of mind of knowing that everything is together. Next time I need to pack the air mattress for a trip I won't need to worry about forgetting the pump or the charger. You should try this yourself. PS. 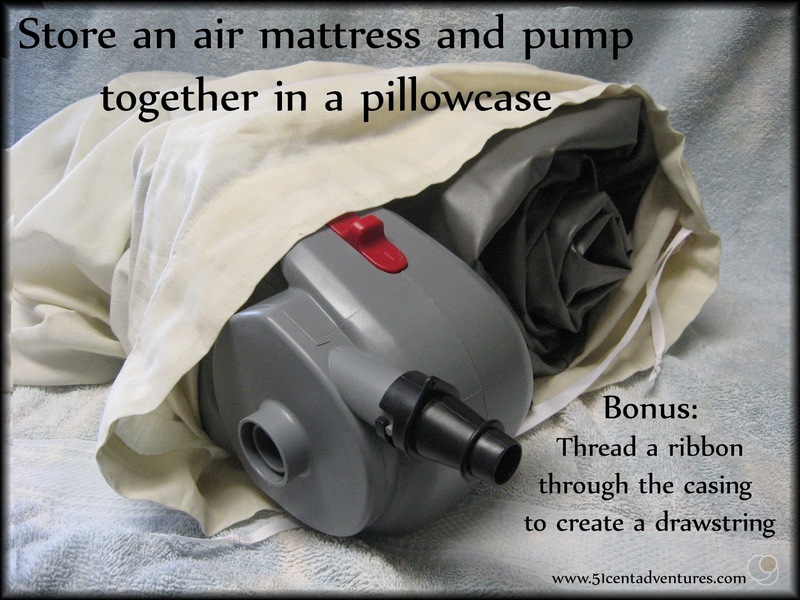 Here are two things to keep in mind about re-chargable air mattress pumps. 1. They have to be charged for about 10 hours before the first use. So you can't just buy one at the store and expect to use it right away. 2. They won't work while charging. 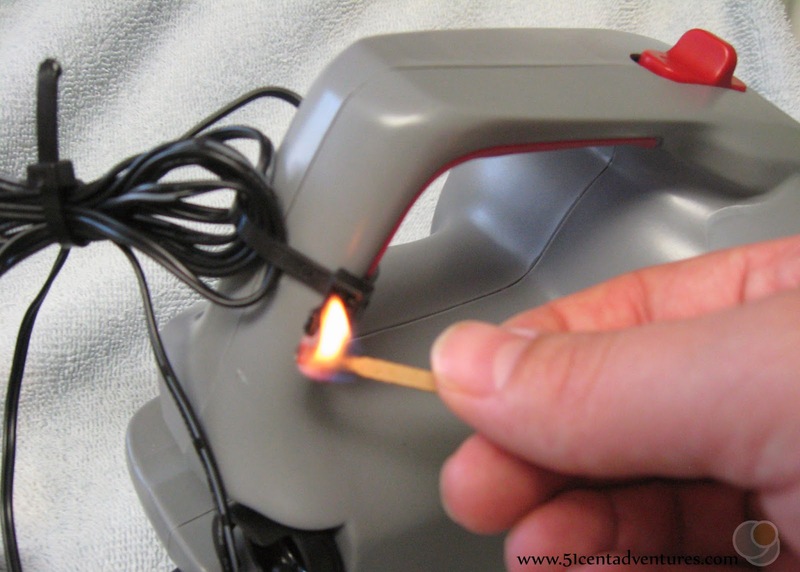 In fact, some models don't even work if the cord is still plugged into the pump. So if your pump is fully charged- but won't work- make sure the little plug is unplugged from the pump.